Do you suffer from chronic or even occasional digestive discomfort? Bloating, gas, heartburn, constipation, diarrhea? Do certain foods aggravate these symptoms more than others? What about joint pain, weight gain, skin rashes, autoimmune disorders, hormone imbalance, headaches, or depression? Do you rely on medicine to ease the symptoms of these imbalances? What if you didn’t have to? If you read it, hopefully, this translated into major time savings for you or someone you care about. I always tell my Dad that I feel like I’m carving my path through a jungle with a spoon. My sincere intent is that my dull, spoon-cut path, can somehow put a much sharper tool into your hands as you carve yours. When the doctors at Bastyr University first diagnosed my food allergies in 1995, I asked them how food allergies started. At that time, they explained that stress and trauma weaken the immune system, as do certain foods, by compromising the lining of the small intestine. When the lining of the small intestine is weakened, food particles can escape through it and leak into the bloodstream. These food particles don’t belong there, so the body sees them as foreign invaders and will create antibodies to fight them. As these antibodies develop, your body believes you have an allergy to that food. And so begins the Leaky Gut cycle. This was the simple, layman’s terms, explanation the doctors at Bastyr gave me in 1995. Can You Heal Leaky Gut? My $64,000 question. My quest for the last 20 years, I’ve been working to heal my leaky gut, to repair small intestine. I eliminated my food triggers and changed my lifestyle. I went on the GAPS diet, the SDC diet, stricter versions of Paleo, and despite eating so clean, in a tiny little box, I continued to have an array of health issues, from my hypothyroidism to out of whack hormone levels, adult onset acne, and on and off digestive issues. In addition to my dietary changes, I also exercise regularly,multiple times a week. I started practicing meditation and deep breathing exercises. Nothing changed. In fact, some of symptoms worsened over the last few years. Whaaaat?? With all I’m doing to take care of myself, how could this be?? Could my leaky gut be getting worse despite all my efforts? I’ve been convinced that my rainbow of health issues were somehow tied to my leaky gut, this “intestinal hyperpermeability” in my small intestine. But over the years, I couldn’t find a doctor who agreed. Not only that, despite how much I read about leaky gut, I failed to find anyone with a regimen to heal it, not one that worked for me at least. Hence, the feeling that I could really use a machete instead of a spoon to carve my path through this leaky gut jungle. Did I Just Score a Machete to Heal My Leaky Gut? Many doctors haven’t recognized leaky gut as a real issue, much less as a core issue at the root of a number of medical problems. 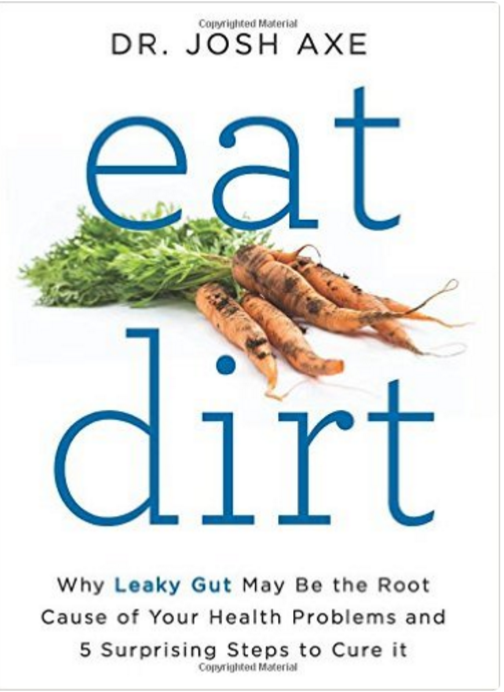 But as explained in his book, Dr. Axe believes that leaky gut is a major contributor to my continued digestive, hormonal, and thyroid imbalances. Not only that, he believes it sits at the root of many medical conditions, like depression, skin conditions, seasonal allergies, headaches, autoimmune diseases, autism, rheumatoid arthritis, and many others. Dr. Axe explains that we have tight junctions which are the gateway between our small intestine and the bloodstream. It’s their job to keep toxins and undigested food particles from passing through. When you have leaky gut, it’s like the gates are left open. These tight junctions don’t do their job and particles and toxins pass into the bloodstream. Dr. Fasano discovered Zonulin, the regulator of the tight junctions, or gateways. He found that gluten and gut bacteria are the two biggest triggers to open the “Zonulin door,” causing the gateways to stay open, amplifying the leaky gut issue. Dr. Axe also explains that casein, a protein found in dairy, especially cow’s milk, is another Zonulin trigger. When healing leaky gut, it’s just as critical to remove Zonulin triggers as it is to add supplements to heal the damaged tissue lining. The Dr. Axe Leaky Gut regimen described in his book has worked for his mom, helping to cure her from cancer, and has helped thousands of patients in his practice heal from numerous imbalances. He begins by breaking down the gut types into five categories. He has a test on his website to help you determine which gut type you are. Once you have identified your gut type, Dr. Axe outlines a recommended diet and supplements for each type in his book. Take the Dr. Axe Gut Type Quiz to determine your gut type. If you choose to follow the regimen, follow it as closely as possible for at least 90 days. Depending how closely you follow it, and how much healing your body needs, you may need to follow it for 6 months or a year. New cells develop approximately every 3 months, so I like to follow 3 month markers when I’m making changes and healing. Once your system heals, I would expect to say goodbye to gluten, casein, and refined sugar (affects bacteria gut balance) for the long haul given their discovered effect on Zonulin. But as with all things, it’s your body, it’s your choice. 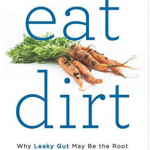 Identify the recommended diet for your gut type (found in “Eat Dirt”). Make peace with letting go of certain foods. It’s ok, you can do it. Identify the recommended supplement regimen for your gut type (found in “Eat Dirt”). Email me from the icon in the top right corner or leave a comment below. Before making any significant dietary or supplement changes, you may want to discuss them with your doctor or primary health care practitioner, especially if you have existing medical conditions or concerns. I always let my doctor know my current supplements list.